Varicose veins come in many forms. Just below the surface of your skin you may notice reticular veins – larger vessels that are dark blue in colour. These can sometimes appear to join together to form a stream or river travelling down the leg. It is important to treat these vessels, along with the spider veins to achieve long-term cosmetic improvement. Varicose Veins can be either blue in colour, if close to the skin, or may appear to be of normal colour. 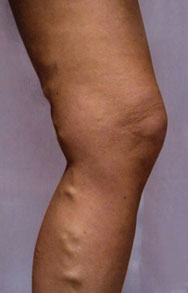 Large varicose veins are the bigger and more ropey ones that can be seen from a few metres away. They often extend from the groin to below the knee or behind the knee and can cause pressure problems on smaller veins. Varicose Veins are a medical condition. They occur because the superficial vein systems are not working. Only about 2% of the blood from the legs travel through these veins and they are usually small. They are the Greater Saphenous Vein and the Short or Small Saphenous Vein. When the valves in these veins stop working the vein slowly fills up with blood, stretching the vein. The weight of the blood sitting in these veins causes pressure in the lower leg which can cause pain, heaviness, aching etc. Long term problem can be leg ulcers. A solution to the abnormal flow must be found in order to make the leg look better as well as prevent the diseases that backpressure in veins can cause. Small varicose veins can be a cosmetic concern, and this is a very real problem for women who want to feel confident about their appearance and enjoy an active Australian lifestyle – wear skirts or shorts, or go to the beach.Large varicose veins can cause serious damage to the tissue in the lower leg and large bulging veins are unsightly. Some people with spider veins can be on their way towards greater vein problems. About 30% of the population has varicose veins. There are two ways we treat varicose veins. For the large varicose veins we can use Endovenous Laser Ablation to permanently close the Greater Saphenous Vein or the Short Saphenous vein. We Laser veins over 6mm in diameter and that are straight . If we Laser the top part of the veins we follow up with ultrasound guided sclerotherapy (UGS) injections to the veins below the Lasered vein. All the veins must be treated to prevent regrowth in the years to come. The other way to treat the varicose veins is by injections alone with Ultrasound Guided Sclerotherapy (UGS). We do check-up ultrasound scans at 1 month,2 months and 6 months after the procedures to ensure closure of the veins.These check-ups are on Medicare, with no extra cost to you. Both these procedures are explained in more detail in another section of the website, just select Endovenous Laser Ablation or Ultrasound Guided Sclerotherapy on the list.